The phone call came minutes after I walked off stage after a speaking program. It was my wife Kim, alerting me that my dad wanted to arrange an urgent family meeting for the next day. As he has a bit of a history of overhyping things, I couldn’t help but wonder about the true importance of this meeting, especially since the following day was the only day I’d be home in the span of a week. A call back to Dad confirmed that the situation was serious, and he was adamant that he didn’t want to tell us the news by phone. And so began a 24-hour waiting period in which the only thing to do was entertain worst-case scenarios and pray that somehow, things would work out. I spent the rest of the evening trying to get my mind off it, suddenly empathizing with everyone who has ever had to wait for a diagnosis. No matter how dire the news, there is a certain peace in at least knowing what you’re dealing with. But the waiting (and the not knowing) is torture. The next day, my brothers and our wives convened at the home of my youngest sibling. While waiting for my parents to arrive, we ate some pumpkin desserts my sister-in-law had whipped up, as if the sweetness would somehow counteract the sour news we all anticipated. A million years later, my parent’s car pulled into the driveway. My mom looked like she was wearing a white sweatshirt with the hood pulled over her head. This did not look good, and seemed to confirm our suspicions that this terrible news was centered around her. 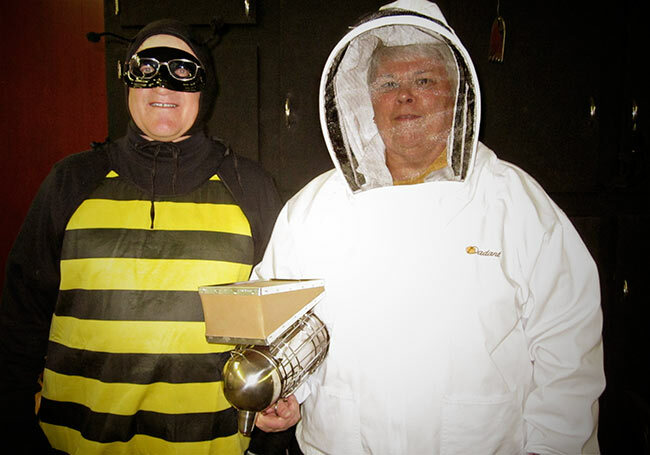 As they got out of the car, we could see that Mom was in fact wearing a beekeeping costume, and my dad was dressed as a bee! Hugs we exchanged and it seemed like my parents were in good spirits. I wanted to exhale, assured that my worst fears were just the by-product of an overactive imagination. I glanced at the uncertain smiles on the faces of my family members and hoped that we’d soon be pleasantly surprised with positive news that we never saw coming. Then my dad set up a makeshift cardboard podium in the living room and pulled out a homemade sign made on loose-leaf paper that he taped to the front. It read “Stuff Happens.” Below that was a smiley face next to a frowny face. The frowny face had an “x” through it. Hope quickly evaporated from the room. It felt hard to breathe. We braced for the worst. All eyes were fixed on my Dad, who started things off by reminding us of how many tough challenges we’d gotten through as a family over the years. On and on he went, testing the patience of his children and his wife, who was sitting in a chair on the opposite side of the room. Finally, this man, my father, the one dressed up like a bee, bravely told us that he had cancer. At first, my heart plummeted into my stomach. But as he explained the kind of cancer he had (prostate), shared that they had caught it so early, and told us how high the survival rate was, hope slowly returned. He said that he and Mom had resolved to be positive and optimistic, which is why they decided to lighten the mood by coming dressed in the Halloween costumes they had worn at a party the night before. We eventually learned that my parents had worn the costumes for the entire two-hour drive up to Wisconsin, a trip that included a stop to pump gas, as well as a run through the Burger King drive-thru. As the mood lightened and we followed my parents’ optimistic lead, all I could think about was, I bet no one in the history of ever has told his family that he had cancer while wearing a bee costume. But that’s exactly what my dad did. He also served as a shining example of how even though we can’t control what life throws at us, we can control whether or not we’ll go down looking or swing for the fences. My dad came though the other side, prostate-free but filled with perspective and gratitude. Since then, my Mom has overcome her own battle with uterine cancer. And both tell me they feel like they won the lottery. In their regular visits to the Cancer Treatment Center of America, they encountered people who were in a much tougher fight, many of whom weren’t likely to make it through. Meanwhile, Kim and I have met a lot of beautiful families through our work with the Make-A-Wish Foundation, all of whom have been dealt hands I wouldn’t wish on my worst enemy. It’s impossible not to want to help. But how do you help fight cancer? It’s so big and scary and ugly, and we are so small. One of the things my dad does is hand out Bee pins. 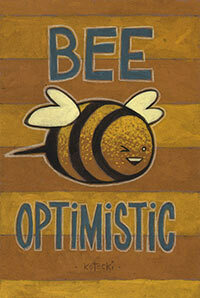 Shortly after the big meeting with the bee and his keeper, I made a painting for my dad featuring his favorite insect and the message, “Bee Optimistic.” It was equal parts encouragement and tribute to his positivity. He asked if I could make him a “Bee Optimistic” pin that he could wear every day. I did, and he does. He’s purchased hundreds of pins, handing them out to anyone he meets who has been touched by the shadow of cancer, like he’s a volunteer at a marathon handing out water to the the runners. Fighting cancer is a hard race. Faith and hope is the water you need to keep going. When my Dad hands out the Bee pins, he is handing out hope. Although the action is small, the impact is huge. These shirts aren’t just for those actually diagnosed with cancer. Because no one fights it alone. The doctors, nurses, and caregivers (along with a support system of family and friends) are in on the fight, too. I pray that my meager contribution will miraculously turn into something meaningful, whether it’s through the shirt’s inspiring message, or the money we raise for people doing their own good works. It’s one small way to help give Cancer the beat down it deserves. Thanks for your support! Thank you! As a 7 year Ovarian Cancer Survivor, whose doctor just deemed her cured; this message of hope and faith is the only way to approach the fight against cancer. So many need this message. Thank-you for donating also. God Bless you and yours. What a beautiful and inspiring story. Thank you for sharing. I lost my Mom to breast cancer in 1991, and truly appreciate your commitment to beating cancer. Thank you! This is inspiring, I wish the best for your parents!